Papers: In the Oral History of Groton School Collection, 1885-1985, 10 linear feet. 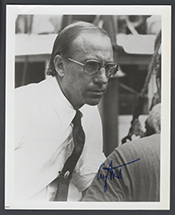 The collection includes an interview with Gerry E. Studds. A finding aid is available in the repository. Papers: 1949-2008, approximately 17 boxes. This collection consists of the legislative, campaign, and other political papers of Rep. Gerry E. Studds, U.S. Congressman from Massachusetts from 1973-1997, including speeches, statements, press releases, newsletters, correspondence, newspaper clippings, briefing books, voter surveys, scrapbooks, and other papers. An inventory is available in the repository and online. The commercial was used during Gerry Studdss campaign for the 1990 U.S. congressional election in District 10 of Massachusetts, Democratic Party.